During my visit to Japan, there are a few days which my hotel did not include the morning breakfast. They charge pretty high so I decided to have my cheap breakfast outside instead. This is how you save money for your travel. One of the best places to find your breakfast is visiting the convenience store nearby. Japanese called it “Konbini”. You see convenience stores every few hundred meters apart. There are several popular chain convenience stores in Japan, such as Family Mart, Lawson and 7 Eleven. Each chain has their specialty to sell and attract their customers to come back. I won’t drill into that now. The one that I am reviewing here is one of the top three giant chain called “FamilyMart”. There are many things I like about the convenient store in Japan. And lets me show you here. If you are familiar with Oden, you know this is one hot-pot dish consisting of several ingredients, such as boiled eggs, fish cakes, chikuwa (another type of fish cake) tofu, daikon/radish, sausages, Konyaku (the jelly stuff which contains very little calorie and only found in Japan, to be frank, taste like rubber to me). Oden usually boiled with a special type of soy-flavored broth. This is self-service so just pick anything you like and pay. My favorite would be tofu, daikon radish, and chikuwa or the Japanese fish cakes and I usually add in some soup. Special tip for you, do ask for the small yellow packet of mustard to dip with these Oden. Well, if you don’t like something spicy, you can just eat the Oden like so and drink the hot soup. Super ideal for the cold season. Each item cost around 100 yen -160 Yen (USD 0.90 – USD1.40) slightly above or below. You can find Oden in all the three popular convenience stores in Japan – Family Mart, Lawson and 7 Eleven. Whenever I come to Japan, I love to come to any of the convenience stores to enjoy their hot “nikuman”. The steamed hot bun is filled with meat/pork. Don’t forget to get the free small packet of mustard to eat with the Nikuman. Nikuman in convenience stores taste amazingly delicious as it is one of their signatures to attract customers. Don’t go to any fancy restaurant for a high priced steam bun. Just visit any of the convenience stores in Japan and ask for “Nikuman”. A must try if you are in Japan. In FamilyMart, you find a special brand called “Mother’s canteen” お母さん食堂. It is a series of food delivered by only Family Mart, (you can’t find this brand in the rest of two convenience stores, Lawson and 7 Eleven, but they do have other good stuff too). Family Mart’s intention is to provide warm products that are nostalgic for everyday life, delicious and convenient product, just like your mommy cooking. There are a lot of young people do not stay with their parents when they start University life and stay away so at least they can come to Family Mart to enjoy their mommies’ cooking. Bongore ボンゴレ is a very popular clam pasta dish in Japan. The original reading should be Vongole (Japanese pronounce their V to B ) and it is a pasta dish of Italian cuisine using clams. I can’t tell you how yummy this dish is and it only cost 430 yen (USD 3.90). This is one of my favorite. All convenience store stock up with plenty of Onigiri with different filling to choose from, such as tuna & mayonnaise, grilled salmon, mentaiko (spicy salted roe), umeboshi (salted pickled plum) and shiso leaf, seasoned kombu seaweed, and many more. My favorite are mentaiko and seasoned kombu seaweed. I can never enjoy the umeboshi (salted pickled plum). It is so sour that even a blind man can open his/her eyes. Onigiri rice ball usually cost 100 yen to 150 yen (USD 0.90 to 1.40). If you are new to Japan, then you must try these popular snacks which have the shape of little pyramids. You will be surprised Japanese convenience stores has a very high quality of dessert, it does not lose to the standard in bakeries shop. This is because, in order to survive, the convenience store in Japan needed to have high-quality products be it ice-cream, pudding, jelly, cakes etc to attract their customers. As I mentioned earlier, you find a convenience store every few hundred meters. In total, estimated over 50,000 convenience store found in Japan. 7. Konbini Beverages – Amazing choices! There are a huge variety of beverages to choose from in Konbini Japan. The best thing is the price is really affordable, usually, range from 100-200 yen (USD 0.90 – 1.80). Let’s say you want to have your coffee or tea, you can either have it cold or hot. There is a cold and hot section for you to choose from. In winter, I like to have my coffee or tea hot but in summer I like to have my coffee or tea cold instead. The soft drinks ranges are amazing too, you have the gas and non-gas drinks in many different flavors. Many of the Konbini also offer season drinks with very attractive packaging. If you don’t grab when you see it, you will miss it and it never is back again after the season even with popular demand. This is how they attract customers. They want you to miss the taste and never miss any chance when you see some new product you like. In Japan, the Konibi or convenience stores are not like the one we have back home. It has more function too. You can withdraw money ATM, pay the bill and do a photocopy, faxing and scanning. The copy machine here is not ordinary, you can even buy tickets for concerts, sport, movies, theme parks, and highway buses. Preferably in cash when you shop in Japan Konbini. You will see a blue tray at the cashier not only in the convenience store in Japan but everywhere including restaurants or retails shops. This little tray is for you to put your money on the tray instead of the cashier’s hand! This is because it is easier for the customer to dig their notes and coins and display it at the tray. When they return you the change, they will first count the money in front of you, note by note and coin by coin, then hand it over to your hand and not in the tray. The cashier will not place the money to the little tray for you to pick up as it is considered as “tsumetai” – very cold gesture. Hence, the cashier will put the changes in your palm with their both hands. Adult Magazine is usually located near the bathroom and anyone who is going to use the bathroom in the convenience store will likely to see this section. If you go by August 2019, you will still able to check out this section. The adult magazine in the convenience store Japan will be removed from shelf starting from August 2019. These are good reading so will not be removed from the shelf. 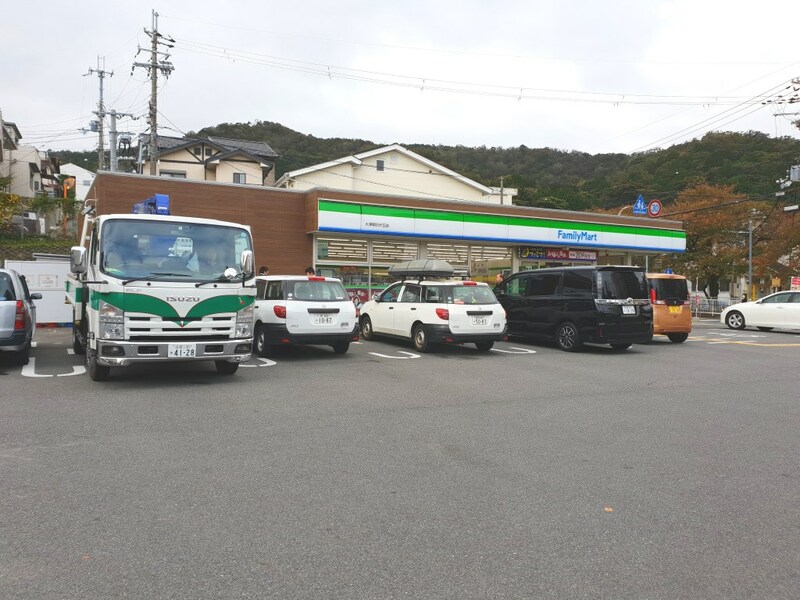 Many of the convenience stores in Japan also offer a sitting area, especially those located at the outskirt. If you can’t find any ready-made bento that you like, you can also buy the ramen cup noodles of your choice. There are free hot water available and free chopsticks, fork or spoon. You will find other things such as things for camera’s SD card, stationery, formal envelopes for a wedding (in case you are attending a wedding in Japan and need a proper envelope), underwear, socks & women stockings, little cute toy, and gifts are all found here. Don’t forget to throw your rubbish after you have done with your eating. There are lines of rubbish bin outside the convenience stores. Throw according to the type of rubbish. Japanese convenience stores are havens for the hungry and busy folk of Japan. It is also a haven for tourists like me. These convenience stores usually open 24 hours and 7 days a week. As you can see from the main picture, parking is not an issue at all. Most convenience stores do offer free parking area, so it is really great to go in for either food/drinks or toilet break, especially when you are doing a road trip with self-driving. How convenient is the convenience store in your area? What do you like most in the convenience stores in your area? What do you like most about in the Konbini/convenience stores in Japan? This convenience store looks so much better than any around here, lots of great choices. Thank you for the tips. Most of the conveinece stores in Japan are very clean and tidy, very comfortable to shop. I go to convenience stores almost everyday during my roadtrip in Japan. To get my drinks, snacks and finding treasure inside the stores. They always offer interesting and cute goodies so it is so much fun to visit. The best thing is the parking is free and very big space in front of the store. I swear, everything in Japan is just more fun. If I ever get the chance to go, there are so many things I want to see. Some people may call me crazy, but convenience stores are actually on that list! I love Asian cultures so I would be very interested to visit a Japanese convenience store. I have been to 7 Eleven before in Hong Kong and in China but I don’t remember it being so diverse. I actually love going to supermarkets when I travel and check out different foreign products. Thanks for your comment. Glad to hear that you have been to so many Asian countries, such as the HK and China. I guess you already have great exposure to Asian culture. Things in the convenience store in Japan are fairly different compared to Hong Kong and China. In Japan, the thing they sell is pretty attractive, delicious and guaranteed freshness. Because convenience stores in Japan are the local everyday necessity, it is like a fast food restaurant where the customer can have their meal, buy groceries, pay their bill, buy tickets for the concert, movie, highway bus, photocopying, faxing, scanning and withdraw money from ATM. Every few hundred meters you find a convenience store and it is already integrated into their life. I think they rely so much upon convenience store that they cannot live without. Glad you are going to Japan in the best season. April is the perfect month to visit Japan and you are still able to check out the cherry blossom/ sakura or Japanese called it “hanami” there. Don’t forget to take advantage of the convenience stores, plenty of good stuff with very cheap price. Glad to know that you are learning Korean, wow! We do have “Korean wave” 10 years ago here in Singapore. People watched Korean drama, follow Korean fashion, use their beauty product and learn their languages. We called it the “Korean wave”. I have been to Korea but I didn’t see there have so many giant convenience store chain like in Japan. This was such a great read, thank you so much for sharing your experience with all of us. I love traveling, and love learning about other cultures! Wow so much great information. I’ve never been to Japan so it was really neat to see what the convenience stores are like in another country. Thanks for sharing. I have been to convenience stores in many of the Asian country, such as China, Malaysia, Singapore, HK, Thailand and Taiwan but Japan has one of the best. It is so much fun and interesting to check out their food variety and over 100 of drinks choices. Who would have thought convenience stores could be so full of useful things. I’m very impressed at the seating areas with hot water and chop sticks for using with snacks. Generally speaking ,ours don’t appear to be quite as well equipped in the UK. There is over 50,000 convenience store in Japan and about a few hundred meters you find one so the competition is really very aggressive. Hence convenience store has such facilities to attract the customers. Wow everything looks so clean and organized! I love Japanese cuisine; so many yummy choices! You can have most of the Japanese cuisine in the convenience stores in Japan and these ready-made bento set can be warm up at the microwave oven provided. And the good thing is the price is so much cheaper than outside and the taste and quality do not lose to the outside restaurant or fast food chain. Thanks for your comment. I hope people can go visit the convenience stall in Japan as it does offer a lot of high quality food with very competitive prices. We certainly cannot get such prices back home. The convenience shops are so different over there and the food looks so good! What a fun trip! You are totally right about it. I have been to convenience stores in other parts of the world but nothing like the Japanese convenience stores and their three major giant chains are Family Mart, 7 Eleven and Lawson. You see them every few hundred meter, don’t hesitate, go in and take advantage of their cheap and high quality food. It does help you save a lot of money compare to eating in the restaurants. I love visiting Japanese convenience stores whenever I re-visit Japan. That’s is part of the ritual for me and the most exciting part of my travel.